an acute or chronic inflammation of the skin caused by exposure to ionizing radiation, as in cancer radiation therapy. Symptoms, which may not appear until 3 weeks after exposure, include redness, blistering, and sloughing of the skin. In severe cases the condition can progress to scarring, fibrosis, and atrophy. There may also be changes in skin pigmentation. Also called radiodermatitis. An acute or chronic inflammation of the skin caused by exposure to ionizing radiation, typically as part of cancer radiation therapy; can range from erythema to wet desquamation of the skin (tissue sloughing) in acute form; tissue atrophy, fibrosis, and permanent scarring in chronic form. Permanent changes in skin pigmentation can also occur. 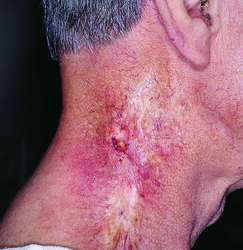 Dermatitis due to radiation exposure. Acute radiation dermatitis presents as skin pain, erythema, edema, dry or wet scaling, discharge, pruritus, ulceration, bleeding, and necrosis. For more information on radiation dermatitis and recommendations for practice, view the full article by Feight et al. This simple treatment could provide a means to reduce radiation dermatitis. The Phase II trial is aimed at evaluating the safety, tolerability and efficacy of RTA 408 Lotion compared with the prevention and treatment of radiation dermatitis in breast cancer patients for whom radiation therapy is recommended. WASHINGTON -- Emollients and hydrogels are effective for treating radiation dermatitis in patients with breast cancer--as long as these topicals don't delay or interfere with radiation therapy, Dr. In some cases, radiation dermatitis may become so severe as to necessitate interruption or cessation of radiation therapy. Neither the emollient nor the steroid prevented radiation dermatitis, However, both delayed the peak severity scores of skin condition and transepidermal water loss to 6 weeks after the initiation of radiation, compared with 5 weeks for controls. Under the supervision of a healthcare professional, it is indicated to manage and relieve the burning, itching and pain experienced with various types of dermatoses, including atopic dermatitis and radiation dermatitis. Patients were assessed using a radiation dermatitis severity score, redness measurement, digital imaging of skin changes, and completion of two self-report questionnaires. Do Selenium and Vitamin E Cause Prostate Cancer? In our 3 years there had been the shrinking tumor; the hospitalization for pulmonary emboli; and the visits for radiation dermatitis, osteoporosis, and the sprained ankle sustained during marathon training.